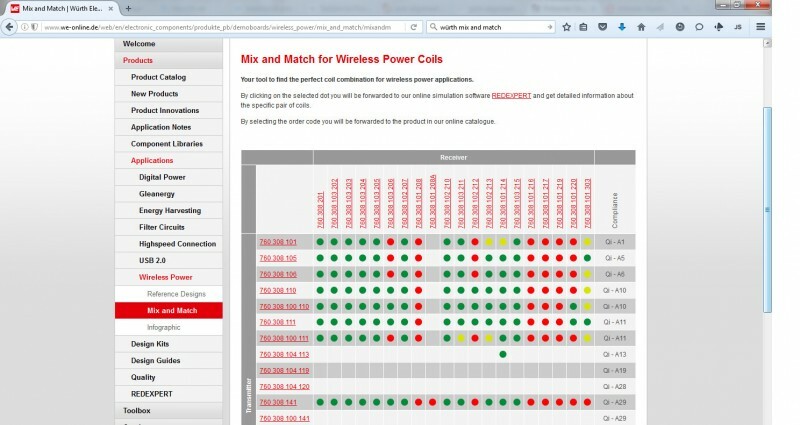 Wurth Elektronik now offers developers with a tool—Mix and Match—to help select the right transmitter and receiver coils. Mix and Match is a new tool in the RED EXPERT Toolbox. Also like the other tools in RED EXPERT, Mix and Match shows online accessible product specifications. While some combinations of transmitter and receiver coils work well, some combinations aren’t good matches. Mix and Match helps you find suitable coils for your application. The free Mix and Match online tool will be expanded as time goes on. 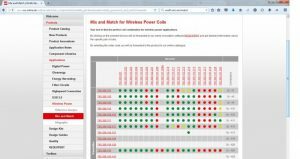 In Q4 2016, Wurth is slated to publish data on the resonant circuits of the coil combinations tested. 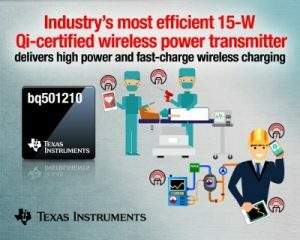 Texas Instruments now offers the industry’s first WPC v1.2 Qi-certified, 15-W wireless power transmitter. Intended to deliver high-power wireless charging to industrial systems (e.g., hand-held medical devices), the bq501210 enables 84% system efficiency with significantly less thermal dissipation. Fixed-frequency operation enables 15-W efficiency and reduces electromagnetic interference (EMI). Fast-charging capability enables the transfer of up to 10 W to compatible receivers, including currently available fast-charging devices. The High-Voltage Dedicated Charging Port (HVDCP) protocol negotiates with capable AC/DC wall adapters to adjust the input voltage. The bq501210 transmitter is shipping in volume production. It comes in a 9 mm × 9 mm VQFN package and costs $3.75 in 1,000-unit quantities. An evaluation module (bq501210EVM-756) is available for $149. Leading RF module designer and manufacturer Lemos International/Radiometrix recently launched a new range of flexible, frequency-programmable, RF power adjustable radios. The new NTX2B Transmitter offers industry-leading true Narrow-Band FM performance. It is available on user/factory-programmable custom frequencies between 425 and 470 MHz. Superseding the popular NTX2, the new transmitter offers greater stability and improved performance due to VCTCXO reference. The NTX2B provides users with the ability to dynamically reprogram the module via the microcontroller UART to other channel frequencies in the band or store new frequency/power settings on EEPROM. 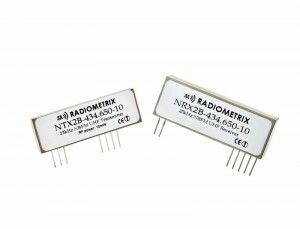 The standard NTX2B version is a 10-mW, 25-kHz narrow-band Transmitter with data rates up to 10 kbps and is available on 434.075 and 434.650 MHz European SRD frequencies and 25 mW on 458.700 MHz for the UK. The NTX2B is also available with 12.5- or 20-kHz channel spacing for licensed US FCC Part 90 or legacy European Telemetry/Telecommand bands. The NTX2B features an internal LDO voltage regulator that enables the transmitter to be operated down to 2.9 V and up to 15-V voltage supply at a nominal current consumption of 18 mA and less than 3 µA in power-down mode, which can be enabled within 5 ms. NTX2B can transmit both digital and 3-VPP analog signals. Offering greater range than wideband modules, the transmitter can be paired with the new NRX2B receiver for a usable range of over 500 m, which is ideal for performance-critical, low-power wireless applications, including security, sensor networks, industrial/commercial telemetry and remote control. Local Positioning System (LPS) and GPS (not just the US system) both use several transmitters to enable a receiver to calculate its geographical position. Several techniques are possible, each with its advantages and drawbacks. The important thing in all these techniques is the notion of a direct path (line of sight, or LoS). In effect, if the transmitter signal has not taken the shortest path to the receiver, the distance between them calculated by the receiver will be incorrect, since the receiver does not know the route taken by the radio signal. Three mathematical techniques are usually used for calculating the position of a receiver from signals received from several transmitters: triangulation, trilateration, and multilateration. The last two are very similar, but should not be confused. Triangulation (Figure 1) is a very ancient technique, said to date from over 2,500 years ago, when it was used by the Greek philosopher and astronomer Thales of Miletus to measure (with surprising accuracy) the radius of the Earth’s orbit around the Sun. 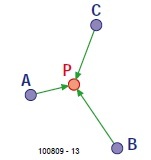 Figure 1—Triangulation: you are at A, from where you can see B and C. If you know their geographical positions, you can find your own position with the help of a compass. It allows an observer to calculate their position by measuring two directions towards two reference points. Since the positions of the reference points are known, it is hence possible to construct a triangle where one of the sides and two of the angles are known, with the observer at the third point. This information is enough to defi ne the triangle completely and hence deduce the position of the observer. Using triangulation with transmitters requires the angle of incidence (angle of arrival, or AoA) of a radio signal to be measured. This can be done using several antennas placed side by side (an array of antennas, for example, Figure 2) and to measure the phase difference between the signals received by the antennas. 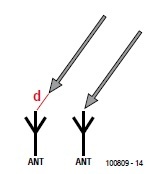 Figure 2—An antenna array makes it possible to measure the angle of incidence of a radio signal, and hence its direction. 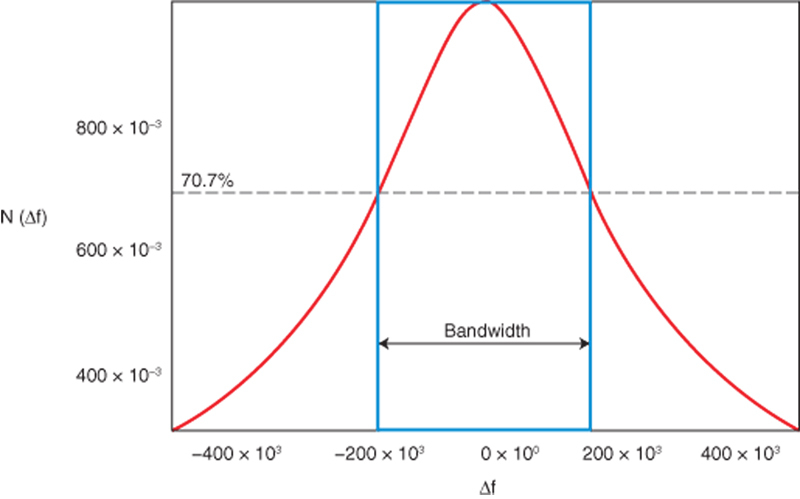 If the distance between the antennas is small, the incident front of the signal may be considered as straight, and the calculation of the angle will be fairly accurate. It’s also possible to use a directional antenna to determine the position of a transmitter. The antenna orientation producing the strongest signal indicates the direction of the transmitter. All you then have to do is take two measurements from known transmitters in order to be able to apply triangulation. This technique requires the distance between the receiver and transmitter to be measured. This can be done using a Received Signal Strength Indicator (RSSI), or else from the time of arrival (ToA)—or time of flight (ToF) Figure 3—of the signal, provided that the receiver and transmitter are synchronized — for example, by means of a common timebase, as in GPS. Figure 3—The length of the arrows corresponds to the arrival time at receiver P of the signals broadcast by three transmitters A, B, and C. It forms a measurement of the distances between the transmitters and the receiver. Thus, when receiving a signal from a single transmitter, we can situate ourselves on a circle (for simplicity, let’s confi ne ourselves to two dimensions and ideal transmission conditions) with the transmitter at the center. Not very accurate. It gets better with two transmitters — now there are only two positions possible: the two points where the circles around the two transmitters intersect. Adding a third transmitter enables us to eliminate one of these two possibilities (Figure 4). Figure 4—2-D trilateration. In 3-D, another transmitter has to be added in order to determine a position unambiguously. When we extend trilateration to three dimensions, the circles become spheres. Now we need to add one more transmitter in order to fi nd the position of the receiver, as the intersection of two spheres is no longer at two points, but is a circle (assuming we ignore the trivial point when they touch). This explains why a GPS needs to “see” at least four satellites to work. Using a single receiver listening to the signals (pulses, for example) from two synchronized transmitters, it is possible to measure the difference between the arrival times (time difference of arrival, or TDoA) of the two signals at the receiver. Then the principle is similar to trilateration, except that we no longer fi nd ourselves on a circle or a sphere, but on a hyperbola (2D) or a hyperboloid (3D). Here too, we need four transmitters to enable the receiver to calculate its position accurately. The advantage of multilateration is that the receiver doesn’t need to know at what instant the signals were transmitted—hence the receiver doesn’t need to be synchronized with the transmitters. The signals, and hence the electronics, can be kept simple. The LORAN and DECCA systems, for example, work like this.—Clemens Valens, “Geolocalization without GPS,” Elektor, February 2011. The 7802e is a PCI Express serial interface adapter that provides eight serial ports individually configurable for RS-422 or RS-485 communications. The adapter is well suited for applications including test and measurement, security systems, and broadcast. The board’s high-performance 16C950 UART includes 128-byte FIFOs for error-free operation in high-speed serial applications. The 16C950 UART also supports 9-bit framing and is software compatible with legacy UART applications. A PCI Express link supplies the 7802e’s 62.5-MHz clock. This ultra-high speed clock is divided by a flexible 8-bit clock prescalar. In RS-485 mode, the transmitter is automatically enabled in hardware, eliminating the need for application software control. This enables the 7802e to be used with standard serial applications without the risk of bus contention and data corruption. 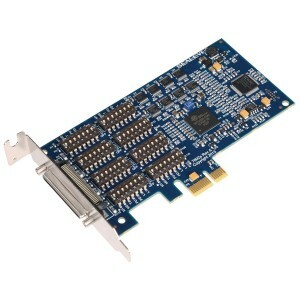 All Sealevel PCI Express serial adapters include SeaCOM software for Windows and Linux OSes. The adapters also include WinSSD, a full-featured application for testing and diagnostics including bit error rate testing (BERT), throughput monitoring, loopback tests, and test pattern message transmissions. You need a guitar amplifier to play an electric guitar. The guitar must be connected with a cable to the amplifier, which you might consider an inconvenience. Most guitar amplifiers operate off the AC power line. 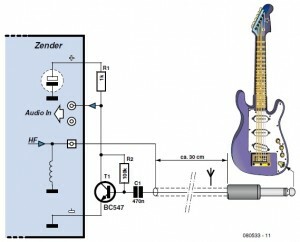 An electric guitar fitted with a small transmitter offers several advantages. You can make the guitar audible via an FM tuner/amplifier, for example. Both the connecting cable and amplifier are then unnecessary. With a portable FM broadcast radio or, if desired, a boombox, you can play in the street or in subway. Designing a transmitter to do this is not necessary. A variety of low-cost transmitters are available. The range of these devices is often not more than around 30′, but that’s likely plenty for most applications. Consider a König FMtrans20 transmitter. After fitting the batteries and turning it on, you can detect a carrier signal on the radio. Four channels are available, so it should always be possible to find an unused part of the FM band. A short cable with a 3.5-mm stereo audio jack protrudes from the enclosure. This is the audio input. 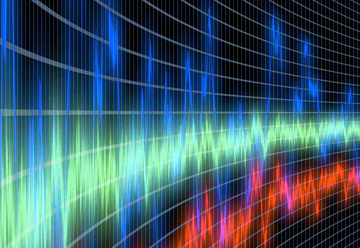 The required signal level for sufficient modulation is about 500 mVPP. 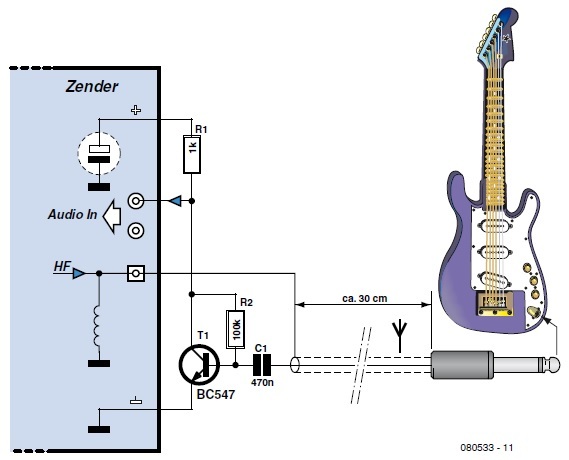 If a guitar is connected directly, the radio’s volume level will have to be high to get sufficient sound. In fact, it will have to be so high that the noise from the modulator will be quite annoying. Thus, a preamplifier for the guitar signal is essential. 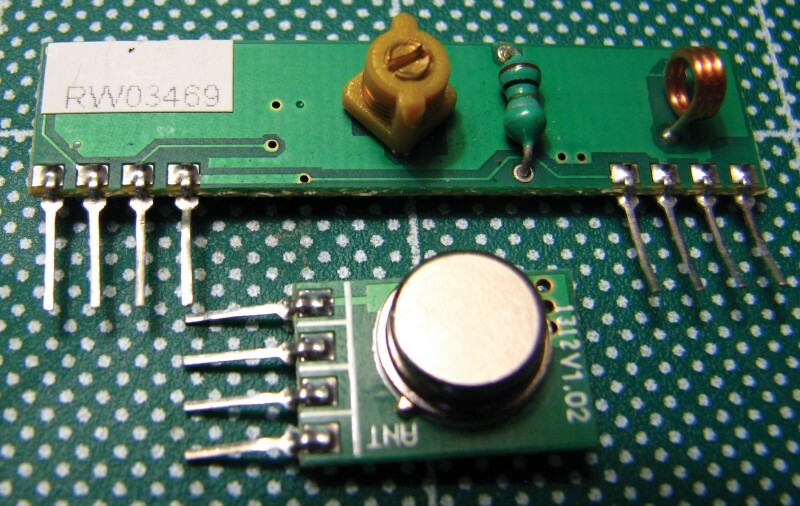 To build this preamplifier into the transmitter, you first have to open the enclosure. The two audio channels are combined. This is therefore a single channel (mono) transmitter. Because the audio preamplifier can be turned on and off at the same time as the transmitter, you also can use the transmitter’s on-board power supply for power. In our case, that was about 2.2 V. This voltage is available at the positive terminal of an electrolytic capacitor. Note that 2.2 V is not enough to power an op-amp. But with a single transistor the gain is already big enough and the guitar signal is sufficiently modulated. The final implementation of the modification involves soldering the preamplifier circuit along an edge of the PCB so that everything still fits inside the enclosure. The stereo cable is replaced with a 11.8″ microphone cable, fitted with a guitar plug (mono jack). The screen braid of the cable acts as an antenna as well as a ground connection for the guitar signal. The coil couples the low-frequency signal to ground, while it isolates the high-frequency antenna signal. While playing, the cable with the transmitter just dangles below the guitar, without being a nuisance. If you prefer, you can also secure the transmitter to the guitar with a bit of double-sided tape. —Gert Baars, “Simple Guitar Transmitter,” Elektor, 080533-1, 3/2009. The Great Plains Super Launch (GPSL) is an annual gathering of Amateur Radio high-altitude ballooning enthusiasts from the United States and Canada. The 2012 event was held in Omaha, Nebraska from June 7th to the 9th and was sponsored by Circuit Cellar and Elektor. Around 40 people from nine states and the Canadian province of Saskatchewan attended Friday’s conference and around 60 attended the balloon launches on Saturday. Amateur Radio high-altitude ballooning (ARHAB) involves the launching, tracking, and recovery of balloon-borne scientific and electronic equipment. The Amateur Radio portion of ARHAB is used for transmitting and receiving location and other data from the balloon to chase teams on the ground. The balloon is usually a large latex weather balloon, though other types such as polyethylene can also be used. A GPS unit in the balloon payload calculates the location, course, speed, and altitude in real time, while other electronics, usually custom-built, handle conversion of the digital data into radio signals. These signals are then converted back to data by the chase teams’ receivers and computers. The balloon rises at about 1000 feet per minute until the balloon pops (if it’s latex) or a device releases the lifting gas (if it’s PE). Maximum altitudes are around 100,000 feet and the flight typically takes two to three hours. On Thursday the 7th, the GPSL attendees visited the Strategic Air and Space Museum near Ashland, about 20 minutes southwest of Omaha. The museum features a large number of Cold War aircraft housed in two huge hangars, along with artifacts, interactive exhibits, and special events. The premiere aircraft exhibit is the Lockheed SR-71 Blackbird suspended from the ceiling in the museum’s atrium. A guided tour was provided by one of the museum’s volunteers and greatly enjoyed by all. Friday featured the conference portion of the Super Launch. Presentations were given on stabilization techniques for in-flight video recordings, use of ballooning projects in education research, lightweight transmitters for tracking the balloon’s flight, and compressed gas safety. Bill Brown showed highlights from his years of involvement in ARHAB dating back to his first flights in 1987. The Edge of Space Sciences team presented on a May launch from Coors Field in Denver for “Weather and Science Day” prior to an afternoon Colorado Rockies game. Several thousand students witnessed the launch, which required meticulous planning and preparation. Saturday featured the launch of five balloons from a nearby high school early that morning. While the winds became gusty for the last two launches, all of the flights were successfully released into a brilliant sunny June sky. All five of the flights were recovered without damage in the corn and soybean fields of western Iowa between 10 and 25 miles from launch. The SABRE team from Saskatoon, Saskatchewan took the high flight award, reaching over 111,000 ft during their three-hour flight. The view from one of the balloons. Image credit: “Project Traveler / Zack Clobes”. The 2013 GPSL will be held in Pella, Iowa, on June 13-15. Watch the website superlaunch.org for additional information as the date approaches.